We’re created by a vote of our community. We are local political subdivisions, not arms of the state government. We’re open access, meaning we accept students regardless of their level of college readiness. We’re governed by locally-elected boards. We’re partially funded by local property taxes as well as tuition, state and federal funding. We serve the education, workforce and economic needs of a defined local region. Our mission is to provide associate degree and certificate programs, and we specialize in workforce development. We also serve as Missouri’s lead institutions in delivering post-secondary technical education in partnership with the state’s area vocational technical schools. The word community plays an important role, and it means exactly what it says. Community colleges were created by a vote of local citizens. As local entities, each college’s academic and workforce training programs mirror the local economy by design. Unlike in some states, we are not a “system” with a centralized administration under one governance structure. Instead, we are 12 separate and independent local colleges, with a history of being responsive and adaptable to state and local needs. 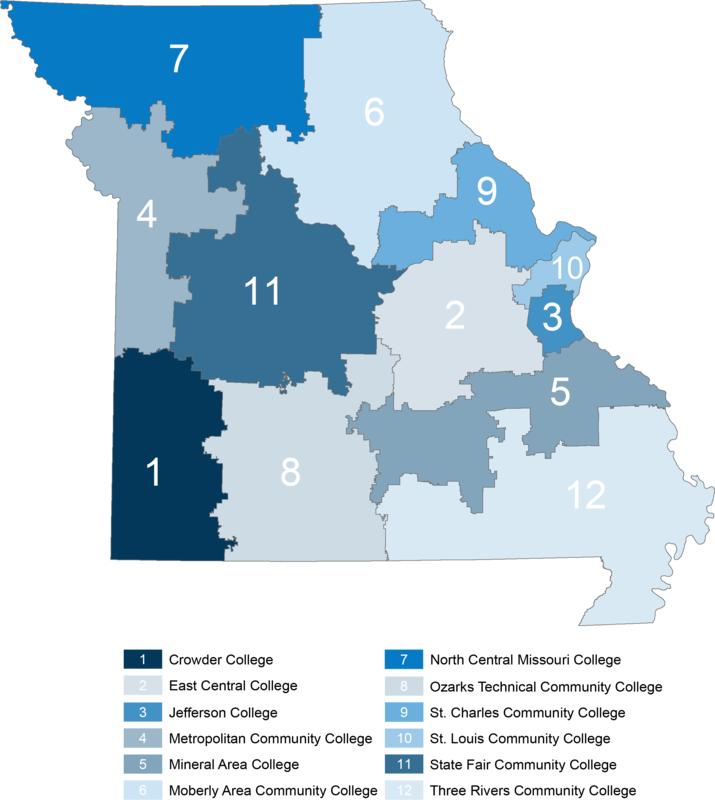 In 1993, MCCA recommended to the Coordinating Board that the state be divided into service regions that would cover the entire state. This network allows community colleges to serve every Missourian and every Missouri business. 36 percent of students attending a public higher education institution in Missouri are enrolled at one of the state’s 12 community colleges. We are open access institutions, meaning that we do not turn students away, even if they are not ready for college level work. As a result, roughly 60 percent of our students take some level of remedial coursework. Because our colleges are open to everyone, we have an incredibly diverse student population, coming from all educational backgrounds and walks of life. Many of our students are the first in their families to attend college; they juggle full or part-time jobs, and many do all of this while taking care of their families at home. Our colleges have to be flexible and innovative to meet students where they are. Tuition and fees for a typical full time student average $3,197 at Missouri’s community colleges. By comparison, the average tuition and fees at the state’s public 4-year institutions is $7,859 and $5,873 at the state’s technical college. Missouri’s community colleges maintain these affordable tuition rates, despite receiving only 15 percent of state appropriations for higher education. Local property tax revenue makes up a portion of the funding gap, but this varies significantly from college to college. For example, at one college property taxes account for a mere 2.3 percent of revenue while at another they amount to almost 36 percent. What isn’t accounted for by property tax revenue has to be made up by private donations, grants or tuition. This is why state funding and student aid are such important factors in maintaining the affordability of a two-year education.